The last night of this year’s samba parade competition, though marred by yet more accidents, was filled by colorful ensembles and lively parades from Rio's top samba schools. 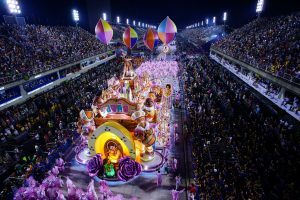 RIO DE JANEIRO, BRAZIL – The final six schools took part in Rio Carnival’s samba parade competition last night, on Monday February 27th, parading down the 700m stretch of the Sambódromo until the early hours of the morning. União da Ilha was the first to parade in the Sambódromo on the final night of 2017’s Carnival competition, photo by Gabriel Monteiro/Riotur. While several schools passed through the avenue with ease, a further three schools had difficulty with their floats causing yet more severe accidents. União da Ilha was the first school to compete, presenting the Angolan legend of Nzara Ndembu. However, the school’s penultimate allegorical float struggled to enter the Sambódromo and had to run through along the avenue. The delay put the school’s display at one hour and fifteen minutes long, and could be considered a serious fault by the competition’s judges. The second school to perform was São Clemente, with their tongue-in-cheek tale of French King Louis XIV’s finance minister, who defrauded public coffers to build a luxurious palace. Outraged by the incident, Louis XIV then imprisoned the minister and commissioned an even grander palace. Mocidade Independente, the next school to proceed through Sapucaí, also encountered serious problems. Filled with Moroccan-themed allegories, including Aladdin’s flying carpet propelled by a model aircraft, the school was yet another ambitious display. However, Mocidade had difficulty steering one of their larger floats, and on a different float one member fell when the pedestal she was dancing on collapsed. Fourth to perform, Unidos da Tijuca’s display honoured the U.S.’s musical diversity, paying particular tribute to Brazilian musician Pixinguinha and U.S. musical legend Louis Armstrong. However, the school’s parade found itself at the centre of another severe accident when one of its floats sank over the dancers. Firefighters rescued the dancers in the middle of the competition, but twelve were wounded and five had to be transferred to Rio’s hospitals. Mangueira performing in 2017’s Carnival parade competition, photo by Fernando Grilli/Riotur. Portela was the next samba school to parade along the Sambódromo’s avenue, telling the story of human civilization’s relationship to water. The school’s display passed without incident, with religious and mythical tales about water plus references to more recent occurrences, such as the Mariana environmental tradegy. Closing this year’s competition, last year’s reigning champions Mangueira presented a strong entry with show or Brazilian religious syncretism. The display featured deities and saints from religions practised across Brazil with figures from Catholicism and Candomblé alike, with Carnavalesco (Carnival designer) Leandro Vieira telling Brazilian media EBC of his hopes that this year’s display would create a more peaceful relationship between the Church and the samba schools. The results of this year’s competition will be announced by the Independent League of Samba Schools (LIESA) on Ash Wednesday, March 1st. The highest-performing schools will have the chance to perform again in the Sambódromo this Saturday in the Champion’s Parade.